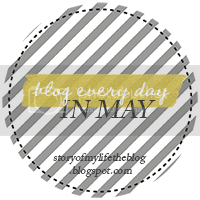 Here we are to Day 4 of this lovely little blog challenge. By the way, I'm LOVING it so far! "Be who you are and say what you mean because those who mind don't matter and those who matter don't mind." I just love this one. I have to remind myself of it alot, I have it posted right by my computer screen. I tend to struggle with comparing myself and my path to others. I have issues not getting down on my lot in life when I look at other people... which is just craziness on my part. I need to always confidently blaze my own little path. This quote reminds me to just do what I feel is right and don't look back. "No matter how little money and how few possessions you own, having a dog makes you rich"
"When the wind blows rough, the tough adjust thier sails." Elizabeth Edwards was just such an inspiration. She of anyone probably has license to just give the whole world the finger, but she doesn't. This quote helps me remember to be flexible and roll with the punches. I love your quotes--I struggle with comparing myself and my path to others' too. Gotta keep remembering that our lives are our own, and if we had someone else's path, it doesn't mean we'd be happy. I couldnt agree more about the pup love! These are all so good. I never get tired of Dr. Seuss. Happy Mothers Day! Also, I miss college. Weekend Shenanigans and What Do I Do?